We don't like to brag or anything (that's a lie), but we have some ingenious costumes designed specifically for kids like yours, with big imaginations. Things like clown vampires, ghost ninjas, or our favorite, this Child Skeleton Dragon costume. 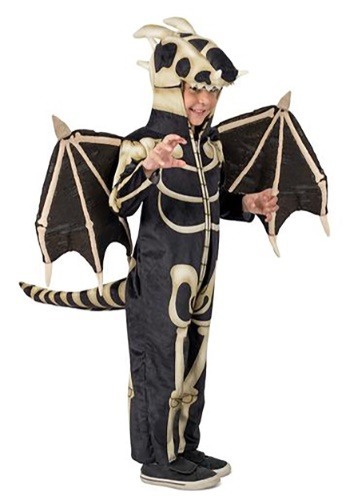 A look this cool will allow your child to settle their debate once and for all, and to become the elusive and feared Skelegon...er...Dragleton?..uh, Skeleton Dragon for Halloween! First off, this costume will keep your child wrapped up warm this Halloween. Why is that a concern? Well, as a skeleton dragon you don't exactly have any meat on your bones to keep your body temp regulated, now do you? You'll need the warmth of this costume's long-sleeved bodysuit to keep you moving throughout the day. This look zips up the front and boasts a dragon skeleton printed atop its black base. A stuffed tail, cool dragon wings (complete with bone pattern), and a dragon skull hood all come together to create one spooky look that's neither here nor there...it's a magical beast all its own! As a skeleton dragon, your child will get to use their imagination to come up with an origin story and all the necessary info folks will want to know. Where do they live? What do they eat? Can they still breathe fire? Being a whole new mythical creature is kind of a lot of work! But at least you won't be returning this costume anytime soon!